Road-trip enthusiasts love searching for oddball attractions like the World’s Largest Ball of Twine. 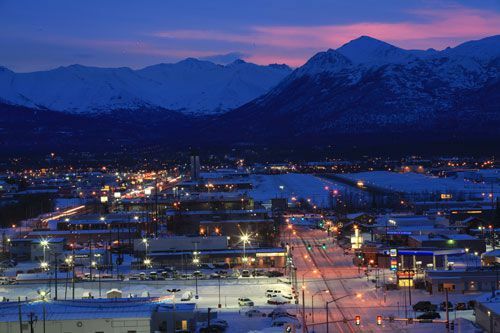 While Anchorage doesn’t have a contender for that title, it does have plenty of other interesting sights that you won’t find anywhere but Alaska’s largest city. 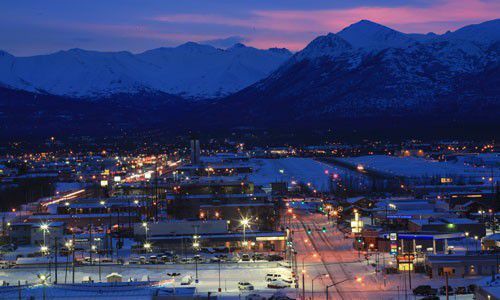 Here is a list of 13 quirky and fun sites you can see during your stay in Anchorage. Forget Willy Wonka’s: All you need to do is visit the Alaska Wild Berry Products store to get a glimpse of this confectionery wonder. If you want to see more than 3,000 pounds of molten goodness cascade down a 20-foot fountain of copper kettles, this is the place. This is the longest combined road-and-rail tunnel in North America, and its noteworthy aspects don’t stop there. It’s the first tunnel to use fans and jet engines for ventilation. It’s the first designed to withstand -40 degree Fahrenheit temperatures, 150 mph winds, and avalanches. The tunnel, constructed during World War II and refurbished for vehicle traffic in 2000, connects the port city of Whittier with the Seward Highway. But “longest” doesn’t mean “widest” – it’s a one-laner. The title of this three-story bronze sculpture by artist Joseph Priniciotti is actually “The Last Blue Whale,” but it’s often referred to as the Whale Drowns Men statue, because that’s what it appears the whale is doing. The vertical whale has overturned a boat with its tail, leaving the hunters exposed to icy waters. A little revenge, perhaps? See it for yourself at 301 K Street. Birding enthusiasts and ghost hunters alike will appreciate Ship Creek. If you’re looking for shorebirds like plovers, sandpipers, and waterfowl, this is the place to visit. Ship Creek is also said to be haunted by the spirit of a Native Alaskan, who was murdered in the 1980s. The area also was the location of the Tent City for early Anchorage settlers about 100 years ago. Also on the spooky side, you can walk by the 4th Avenue Theater, opened in the 1940s as a movie house and later placed on the National Register of Historic Places. It’s got a rich history and is a favorite of Anchorage residents, but is currently closed. Several ghost sightings have been reported, including a man who resembles Austin “Cap” Lathrop, who built the theater and died in 1950. Want to see dinosaur skeletons, ancient mammals or dig for your own fossils? This is the place to learn about the prehistoric and ice age version of Alaska. Located in the Eklutna Village Historic Park, an easy 30-minute drive outside the city, these brightly colored wooden spirit boxes represent a combination of Athabascan Native tradition influenced by the arrival of Russian Orthodox missionaries. The bright colors of the boxes, built over the graves of loved ones, represent family names. On Good Friday in 1964, Anchorage was hit with a magnitude 9.2 earthquake, and the park represents the area where an entire neighborhood slid into the ocean. A portion of the Tony Knowles Coastal Trail passes through the park. See a collection of historic aircraft, some from as early as the 1920s. The museum also offers a winter lecture series and periodic community events like Big Band dances and beer tastings. Get to know everything about the history of law enforcement in Alaska’s rugged frontier at the Alaska Trooper Museum. View antique radios, shackles, wire-tapping equipment and law enforcement memorabilia from around the world. It’s bizarre to think there are sand dunes in Anchorage, Alaska. But secluded in the middle of Kincaid Park, there they are, ready to be explored and made into sand castles. The dunes overlook the ocean, and one of the favorite activities here is searching for Japanese glass fishing floats. This house and museum showcase one of the oldest homes in Anchorage, built in 1915. If you want to catch a glimpse of how early settlers lived, definitely make this museum part of your itinerary. This one is for the die-hard quirk enthusiasts: Visit Alaska in late February or early March for the annual Anchorage Fur Rendezvous Festival. Check the schedule for its long list of serious and goofball events. Where does this one fall? It depends. Anchorage residents are serious about outfitting their outhouses for this race. Not to be missed. Looking for more fun and interesting things to do in Anchorage? Be sure to ask the friendly staffers at the Westmark Anchorage Hotel what they’d recommend!